Dallas mall's code of conduct requires adult supervision of minors after 6 p.m.
NorthPark Center's new code of conduct has several wrinkles for shoppers. Effective immediately, parents or legal guardians must accompany anyone 17 and younger in the mall after 6 p.m. Security can ask anyone not in compliance to leave the mall. Unaccompanied teenagers and children can be asked to produce an ID, such as a driver license, school ID, visa or passport. "It's outrageous, actually," said 19-year-old Tatyana Mitchell. "I think it's crazy, and I probably wouldn't come if I couldn't come after 6 o'clock," said 19-year-old Marisa Ensley. Mall security has begun enforcing NorthPark Center's new code of conduct. Security began issuing warnings to minors younger than 17, who must be accompanied by a parent or legal guardian after 6 p.m. The curfew also extends to moviegoers. Teenagers and children going to NorthPark to see a movie after 6 p.m. should go straight to the theater and leave the building after the movie, the mall said. "We're asking that ... if they're going without a parent, that they go directly to the movie, that they enjoy the movie and that, when the movie's over, that they head to the parking lot," NorthPark spokesman Mark Annick said. Teenagers who work at the mall are exempt from the curfew. 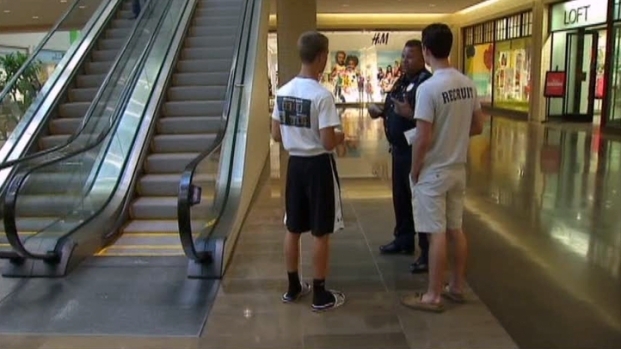 Mall security began informing parents and minors Wednesday night about the new rules. A security guard stopped 17-year-old Grant Swenke and his 15-year-old brother on their way to buy a wallet and gave them a warning and a copy of the code of conduct. "After today, we won't be able to, but if you have your older brother with you, I don't understand why you can't go to the mall," Grant Swenke said. "It's kind of stupid." The mall's code of conduct also said that all visitors must dress "appropriately for a family-oriented shopping center." The dress code forbids visible undergarments, clothing that obscures the face and clothing with lewd, obscene, vulgar or offensive language or images. The rules also say that clothing must "adequately cover the body," so shoppers wearing tank tops or short shorts that reveal too much may be asked to leave the mall. NorthPark representatives said the code of conduct is intended to create a family-friendly environment. "It's a family-oriented environment, and we just think, in that environment, it's a good idea to have common-sense rules for behavior for everybody to follow," Annick said. But some parents said they don't agree with the policy. Lori Kiser said she has fond memories of dropping her teenagers off at NorthPark to shop. "They didn't want to be seen with me, and I didn't want to hang out with them, either. ... I knew they were safe in numbers, and they had their cellphones and could call if there were trouble," she said. "I definitely think that it's going to cost the mall money, but I ultimately think it's kind of a good change," said Brittany Hoffman, who works at NorthPark. NorthPark said it is the No. 1 destination spot in Dallas County for visitors living at least 50 miles outside Dallas. From its 235 stores and restaurants, it expects retail sales to exceed $1 billion this year. The code of conduct is in keeping with a national trend of malls with teen curfews to promote a family friendly environment and cut down on loitering. NorthPark said it believes it is the first local shopping center to adopt a code of conduct.